Austin’s Central Library, located in the Seaholm EcoDiscrict, is one of the city’s greatest accomplishments. Opened in 2018, the library serves as a modern technology and information hub that reflects Austin’s vibrant culture and unique soul. The space reflects natural characteristics of the Hill Country, bringing in mesquite and oak woods, a rooftop garden with the largest solar installation in downtown Austin and picturesque views of Shoal Creek and Lady Bird Bake from every angle. Programming is diverse and accessible to locals and visitors alike, from cooking demos and family-friendly activities to a gift shop and cafe. The library has an informal Town Hall feel and offers tons of resources, activities and, of course, spaces to hunker down with a good book. Central Library Rooftop. Courtesy of the Austin Public Library. Gallery Space: this space is used to showcase local artists and rotates regularly. Though not for sale, guests are encouraged to peruse through the art and can support the artists by following their work. Recycled Reads Gift Shop: the Recycled Reads gift shop sells unique library themed products, exclusives and local artists’ work. All proceeds help support the Austin library system. 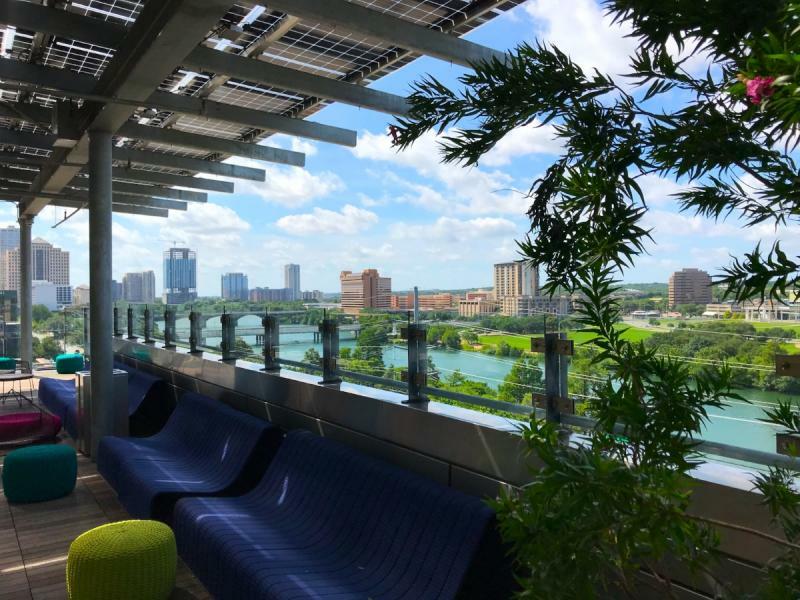 Reading Porches: perhaps one of the best features of the Central Library is the gorgeous reading porches that look over Shoal Creek and Lady Bird Lake. It seats more than 60 people and is a super comfortable way to enjoy the Austin outdoors while staying cool. Cookbook Bar & Cafe. Credit Madeline Burrows. 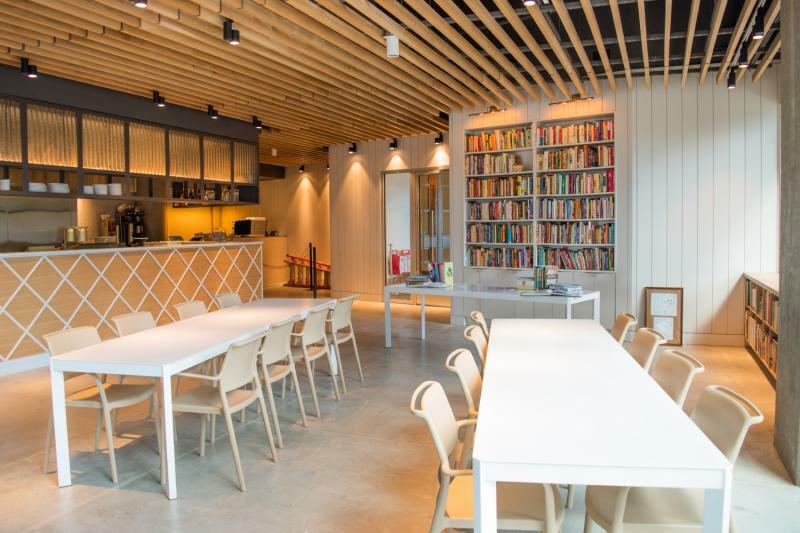 Cookbook Bar & Cafe: this cafe offers visitors farm-to-table, seasonal meals and snacks, tied directly to cookbook publications of local chefs. Cookbook also be hosts cooking demos in the library. Full bar included! This flexible library has many events and activities during the day. It hosts everything from afternoon book clubs, to Practiquemos Espanol (Let’s Practice Spanish) facilitated classes, to free health screenings. For private events, certain spaces in the Central Library are available to rent out. No matter the occasion, the Central Library’s location in the vibrant hub of community, residential and office gathering spaces makes it a must-see place in Austin. Contributed by Visit Austin Marketing Communications Intern Nayla Zylberberg.